Sled dogs are often stricken with intense bloody diarrhea during the Iditarod. Faced with treacherous trail conditions, and sleep deprivation, it’s likely that mushers are taking amphetamines or “speed” to stay awake. In 2017, the Iditarod finally admitted that dogs were drugged. Will the Iditarod now test all mushers for drugs before the race starts, and at every checkpoint? Will the Iditarod disclose all results and ban every offender from participating again in the race? Iditarod “Rule 30 – Use of Drugs and Alcohol” says mushers are “subject to” drug and alcohol testing. That only means tests might be given. The Iditarod is NOT saying that tests WILL be given. Although Rule 30 prohibits drug and alcohol use, the Iditarod doesn’t commit to punishing rule violators, and it doesn’t commit itself to reporting illegal activity to local authorities. Iditarod officials don’t even get the results of drug tests until many days after the race has ended. In 2010, 47 days after the Iditarod ended, the Iditarod revealed that two mushers who finished in the bottom 15 tested positive for Tetrahydrocannabinol (THC), the main psychoactive ingredient in marijuana. Race officials refused to identify the mushers who tested positive and refused to sanction them. Khat can induce manic behaviors and hyperactivity, much like amphetamine. Some laboratories can’t test for khat. Are Iditarod mushers using khat to stay awake? 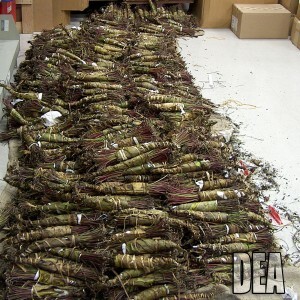 Photo attributed to the DEA. The Iditarod Trail Committee does not publish the list of prohibited drugs on its website. Why is the Iditarod hiding this information from the public? Is it possible for any list to include every drug? “You can test for designer drugs, but only if you know what you’re looking for,” said Jon Danaceau, an associate toxicologist at the University of Utah Center for Human Toxicology. Sophisticated tests can’t always tell the difference between synthetic versions of what the body already makes. And there are so many new drugs that testers can’t keep up. Gene doping is on the horizon and that’s almost impossible to detect. Drug testing still makes sense even though it has its limits. The Iditarod should do whatever it takes to ensure the health and welfare of the dogs. Mushers who suffer adverse effects from drugs are a danger to their animals. The best we can hope for is that the Iditarod adopts the World Anti-Doping Agency’s Code and International Standards, and that the Iditarod drug tests mushers before the race and at every checkpoint, and punishes violators.